After three years of interviewing leading sales, business, and financial success masterminds, Will Barron of The Salesman Podcast has discovered there are individuals who are fundamentally no different that we are. With the new year upon us, Will says it’s time to set the right goals and develop the new personal development habits you need to make 2018 your best year yet. Confirm your Quotable subscription (or subscribe free today) to receive this exclusive e-book, now available on Quotable. 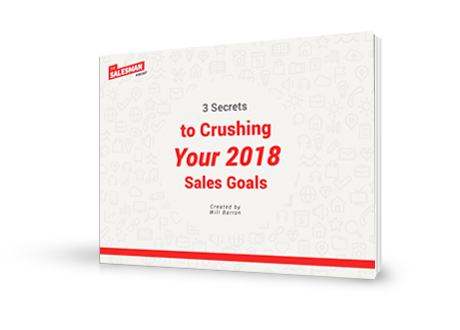 Learn the secrets to bring your selling to the next level. * Yes, I would like to receive Quotable communications as well as marketing communications regarding Salesforce products, services, and events. I can unsubscribe at any time. Yes, I would like to receive Quotable communications as well as marketing communications regarding Salesforce products, services, and events. I can unsubscribe at any time. *By submitting this form, you are confirming you have read and agree to our Terms and Privacy Statement.